The New York State Canal System is not only rich in history, but also culture. Many immigrants worked long and hard on "Clinton’s Ditch" to create this magnificent waterway. Folklore, songs and speech lingo emerged from those individuals working along the Canal. As the population grew and the Canal prospered, it became not only a transportation waterway, but also a vacation area for the well-to-do. At one time, more than 50,000 people depended on the Erie Canal for their livelihood. From its inception, the Erie Canal helped form a whole new culture revolving around canal life. For many, canal boats became floating houses, traveling from town to town. The father would serve as captain, while the mother cooked for the family and crew and the children, if old enough, would serve as "hoggees" and would walk alongside the mules to lead them along at a steady pace. For those who traveled along the Canal in packet boats or passenger vessels, the Canal was an exciting place. Gambling and entertainment were frequent pastimes on the Canal and often, families would meet each year at the same locations to share stories and adventures. Today, the Canal has returned to its former glory and is filled with pleasure boats, fishermen and cyclists riding the former towpaths where mules once trod. The excitement of the past is alive and well. "Traveling on the Erie Canal"
The original Illustration was taken from Graham's Magazine, 1828. The source image was Handset and Letterpress Printed at the Printing Office of the Farmers' Museum, Cooperstown, NY. Begun in 1817 and opened in its entirety 1825, the Erie Canal is considered the engineering marvel of the 19th Century. When the federal government concluded that the project was too ambitious to undertake, the State of New York took on the task of carving 363 miles of canal through the wilderness with nothing but the muscle power of men and horses. Once derided as “Clinton’s Folly” for the Governor who lent his vision and political muscle to the project, the Erie Canal experienced unparalleled success almost overnight. The iconic waterway established settlement patterns for most of the United States during the 19th century, made New York the financial capital of the world, provided a critical supply line which helped the North win the Civil War, and precipitated a series of social and economic changes throughout a young America. Explorers had long searched for a water route to the west. Throughout the 18th and 19th centuries, the lack of an efficient, safe transportation network kept populations - and trade - largely confined to coastal areas. At the beginning of the nineteenth century, the Allegheny Mountains were the Western Frontier. The Northwest Territories that would later become Illinois, Indiana, Michigan and Ohio were rich in timber, minerals, and fertile land for farming. It took weeks to reach these precious resources. Travelers were faced with rutted turnpike roads that baked to hardness in the summer sun. In the winter, the roads dissolved in a sea of mud. An imprisoned flour merchant named Jesse Hawley envisioned a better way: a Canal from Buffalo on the eastern shore of Lake Erie to Albany on the upper Hudson River, a distance of almost 400 miles. Long a proponent of efficient water transportation, Hawley had gone bankrupt trying to get his product to market from what is now Rochester. Sent to debtor’s prison as a result, Hawley wrote a series of essays which were published in the Genesee Messenger beginning in 1807, describing in great detail the route, costs, and benefits of what would become the Erie Canal. In 1810, Thomas Eddy, Treasurer of the Western Inland Lock Navigation Company and State Senator Jonas Platt, hoping to get plans for the Canal moving forward, approached influential Senator De Witt Clinton -- former mayor of New York City and a rising political star -- to enlist his support. On March 13th, a measure was introduced in the State Senate naming a Canal Commission and directing the commissioners to survey a route for the Canal which would connect the Hudson River to the Great Lakes. With Clinton’s support, the measure passed, and the Erie Canal era had begun. Though the War of 1812 created a lengthy interruption in the project’s progress, Clinton and his fellow Canal proponents continued to work to build support for the waterway. In 1816, as a sitting Canal Commissioner, DeWitt Clinton submitted a formal petition to a joint committee of the New York State Senate and Assembly to create a canal system between the Hudson River and Lake Erie. This document, known as the "New York Memorial", generated a series of public meetings in support of the Canal’s construction and effectively began the movement in the state to build the waterway. Ultimately, over one hundred thousand New Yorkers would sign the petition, helping to build a ground swell of public support for the project. On April 15th, 1817, the New York State Legislature finally approved construction of the Erie Canal, which Jesse Hawley had written so compellingly about just a decade earlier. The bill authorized $7 million for construction of the 363-mile long waterway, which was to be 40 feet wide and four feet deep. Construction would begin on July 4th, in Rome, NY and would take eight years. Also in 1817, Clinton would leverage his success championing the Canal’s construction into the Governor’s office, his election culminating his meteoric political rise over the years. The completion of the Erie Canal spurred the first great westward movement of American settlers, gave access to the rich land and resources west of the Appalachians and made New York the preeminent commercial city in the United States. 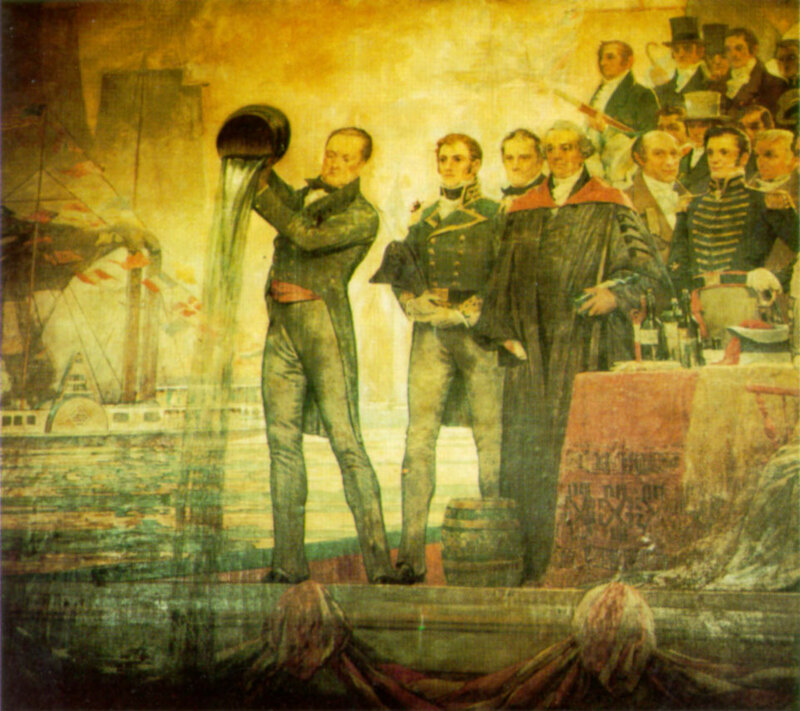 In 1825, Governor Dewitt Clinton officially opened the Erie Canal as he sailed the packet boat Seneca Chief along the Canal from Buffalo to Albany. After traveling from the mouth of the Erie to New York City, he emptied two casks of water from Lake Erie into the Atlantic Ocean, celebrating the first connection of waters from East to West in the ceremonial "Wedding of the Waters". The effect of the Canal was both immediate and dramatic, and settlers poured west. The explosion of trade prophesied by Governor Clinton began, spurred by freight rates from Buffalo to New York of $10 per ton by Canal, compared with $100 per ton by road. In 1829, there were 3,640 bushels of wheat transported down the Canal from Buffalo. By 1837 this figure had increased to 500,000 bushels; four years later it reached one million. In nine years, Canal tolls more than recouped the entire cost of construction. Within 15 years of the Canal's opening, New York was the busiest port in America, moving tonnages greater than Boston, Baltimore and New Orleans combined. The impact on the rest of the State can be seen by looking at a modern map. With the exception of Binghamton and Elmira, every major city in New York falls along the trade route established by the Erie Canal, from New York City to Albany, through Schenectady, Utica and Syracuse, to Rochester and Buffalo. Nearly 80% of upstate New York's population lives within 25 miles of the Erie Canal. Between 1835 and the turn of the century, this network of Canals was enlarged twice to accommodate heavier traffic. Between 1905 and 1918, the Canals were enlarged again. This time, in order to accommodate much larger barges, the engineers decided to abandon much of the original man-made channel and use new techniques to “Canalize” the rivers that the canal had been constructed to avoid the Mohawk, Oswego, Seneca, Clyde and Oneida Lake. A uniform channel was dredged; dams were built to create long, navigable pools, and locks were built adjacent to the dams to allow the barges to pass from one pool to the next. Today, the waterway network has been renamed again. As the New York State Canal System, it is enjoying a rebirth as a recreational and historic resource. The Erie Canal played an integral role in the transformation of New York City into the nation's leading port, a national identity that continues to be reflected in many songs, legends and artwork today. The account of the history of the Erie Canal and the “lateral” canals, as referenced by Roy Finch, was written in 1925 in celebration of the one-hundredth anniversary of the Erie Canal. Mr. Finch was employed with the New York State Engineer and Surveyor, a defunct governmental agency that managed the Canal System from the 1850’s to the mid-1900’s. He was intrigued by the canals and, in celebration of the birth of the canal, thought it useful to share his knowledge and experience with all.